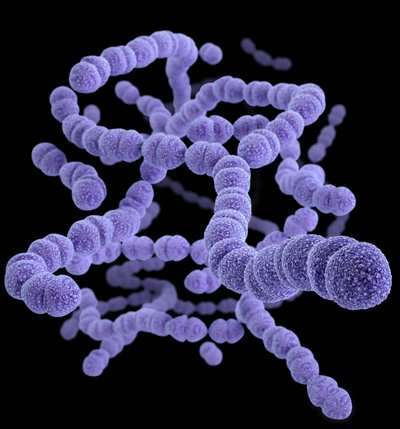 A large-scale genetic and modelling study of Streptococcus pneumoniae has provided new insight into how recently-introduced vaccines have eliminated many strains from the species, and the diverse ways in which the remaining bacteria to compete for the chance to replace them. S. pneumoniae is usually found at the beyond the back of the nasal cavity, where it is normally harmless. However, it can move to other bodily sites, resulting in it causing thousands of cases of severe pneumococcal disease each year in the UK, and a far greater disease burden in many low- or middle- income countries. These infections result in pneumonia, bloodstream infections or meningitis, and are most common in young infants and the elderly. In response, two different vaccines have been introduced to combat S. pneumoniae in the UK: the 7-valent vaccine in 2006, replaced by the 13-valent vaccine in 2010. Since children started receiving the vaccine, there has been a drop in the incidence of pneumococcal disease. After a few years of routine vaccination many strains of S. pneumoniae, including the most prevalent disease-causing ones, had been eliminated. Yet, the bacteria have not become less common in their harmless habitat at the back of the nasal cavity. Instead the vaccine-targeted strains had been replaced by others that less frequently cause disease in children. The latest research, published in Nature Ecology & Evolution, provides a new explanation for how this may occur. This study used three large collections of genomes, sequenced at the Wellcome Trust Sanger Institute, to follow the effects of vaccination in the UK, USA, and Netherlands. Rather than looking at the change in the prevalence of the individual strains themselves, the researchers looked at the frequencies of genes within the highly diverse S. pneumoniae population. While different S. pneumoniae strains dominate in different locations, the detailed information available from whole-genome sequencing revealed that every S. pneumoniae population was similar in terms of gene frequencies. This was also the case when comparing bacterial populations at the start of the vaccination programmes with the same locations a few years later. The researchers' computational modelling showed that this was highly unlikely to have occurred by chance. To accurately explore the dynamics of gene frequencies, the researchers called upon the wealth of genetic data that has been gathered recently and new mathematical methods to compare computer simulations to actual data. The new algorithm developed by Jukka Corander of the Infection Genomics team at the Sanger Institute enabled more precise modelling and sped up the rate results can be estimated using such models by up to 10,000-fold. The results suggest the importance of a particular type of natural selection, in which genes are more advantageous to the bacteria in which they are found when they are rarer – hence the name, 'negative frequency-dependent selection'. This can result from competition between bacterial strains, and detailed analysis of the genome sequences suggests the many ways in which this can happen. For instance, S. pneumoniae cells secrete chemicals to prevent the growth of other strains, are susceptible to infection by different viruses, adopt diverse strategies for acquiring nutrients, and vary in how they are recognised by the human immune system. The relative importance of these different processes are still not well understood. This model promises to shed new light on why some bacteria have such complex population structures that make them difficult to completely eliminate through vaccination. The authors conjecture that the negative frequency-dependent selection happening at the gene level is a common mechanism among different bacterial species. As the use of whole-genome sequencing for epidemiological surveillance becomes more routine, such studies will provide a valuable basis both for designing better control strategies, and for a more thorough understanding their after effects.